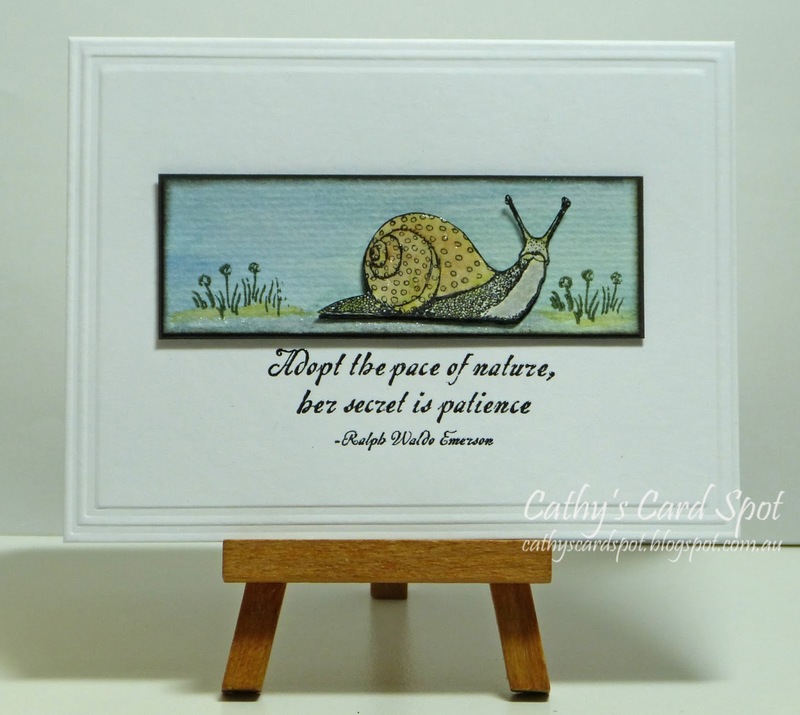 Cathy's Card Spot: Slow and steady, snail's pace. I'm not a huge fan of snail's in the garden, but they are fascinating! I stamped this one onto a scrap of watercoloured paper and also onto some white card, so I could fussy cut, colour and paper piece onto the card. Close up it looks like 4 antenae and you can see the glossy accents on the shell and wink of stella on the snail, and trail lol! At Less is More the theme is to bring something back. In this case it's the sentiment stamp from Darkrom Door that I haven't used in years. It's stored in a tin so I tend to pile things on top of it! The tiny greenery stamp is part of a stamp from Flourishes. Darnell said she'd operated on a stamp to remove the daisy and add an umbrella. I recognized the stamp, went searching and then realized the tiny greenery would fit the snail panel! Thanks Darnell! It's another one that hasn't been used in years. I must check out my stamps more carefully and see how else I could use them. At Simon Says Stamp Monday, the challenge is to be influenced by a myth, fable or story. I know a snail isn't the same as the hare and the tortoise, but that was the fable I got stuck on! I hope that's ok, think this sentiment is a bit like slow and steady wins the race. I've added texture with glossy accents and a touch of black soot ink around the edge of the panel, so I'm also playing at Simon Says Stamp Wednesday. 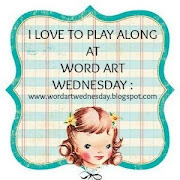 At Word Art Wednesday it's an anything goes sentiment theme or bible verse. Darkroom Door Viva La Flora Vol 2 stamp; versafine ink & clear ep; Flourishes Kid's play stamp; Carabelle un escargot stamp; Versafine green ink; scrap of watercoloured paper; tombow markers; prismacolour pencils; glossy accents; clear wink of stella pen; Stately embossing folder. Oooo I love this! 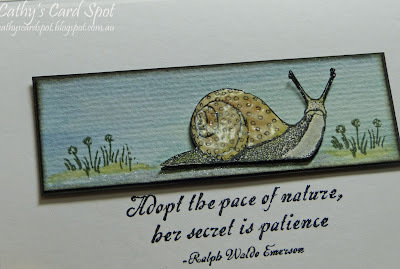 That snail stamp is beautiful and I love the sentiment -so true!! Love the scene you created, yet the design is very CAS. Super work! Thanks for joining us at Less Is More! Stunning card, the border is the perfect frame! Thanks for sharing at Less is More! Fabulous snail Cathy...(now that's something I never thought I'd say!) You have colored him beautifully and he really stands out popped up on your panel. Darling. This is beautiful! 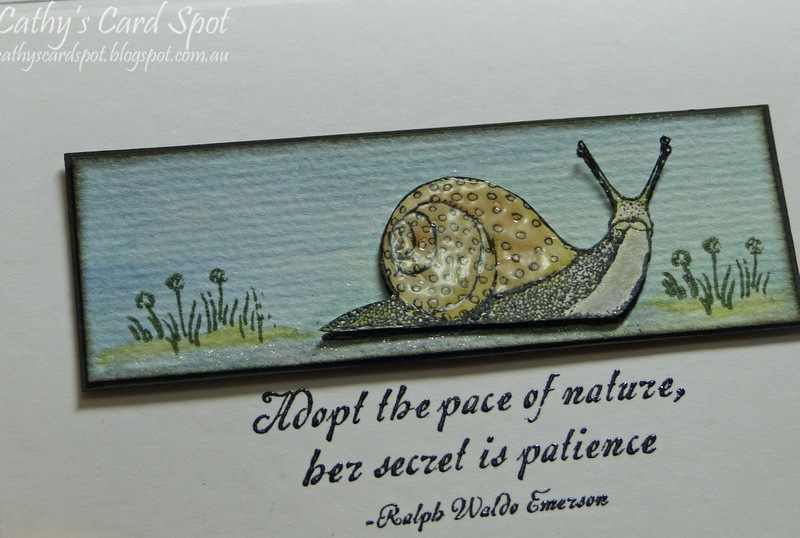 The layout with the panel running across the card is such a great look and that snail is fabulous! So cute! Love the CAS look and the main panel is fantastic, great image and lovely coloring. Thank you for joining Simon Says Stamp Monday Challenge. I'm not crazy about snails but I LOVE this one, Cathy! Love, love, love what you've done with it and the other little stamps! Perfect for this sentiment! Brilliant sentiment for the image, all in all a gorgeous card. I love the whimsy and sentiment, Cathy. The frame and added shiny shell are lovely additions. I am not a fan of snails either although l LOVE your snail Cathy.